Anyone who has ever tried to play a new instrument, rock a new dance move, or master a new sport knows the difficulty of learning a new motor skill – those movements of our muscles that help perform a specific action. Simply watching someone strumming a guitar or hitting a tennis ball isn’t enough to fully understand how it happens. Continuous practice and feedback are crucial to truly perfect and understand everything involved in that movement. 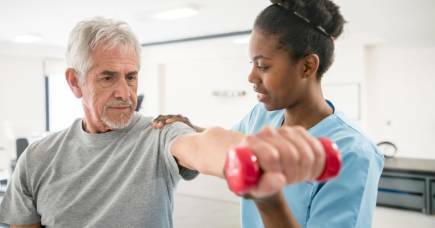 This is a particular challenge in physiotherapy education, where students must master complex fine motor skills to be able to assess and treat physical conditions from back pain to spinal cord injuries. A team of researchers at the Interaction Design Lab at the University of Melbourne has been working on technological innovations to assist physiotherapy students learning these key skills. The latest development is SpinalLog – a novel tool for teaching spinal mobilisation skills to physiotherapy students. 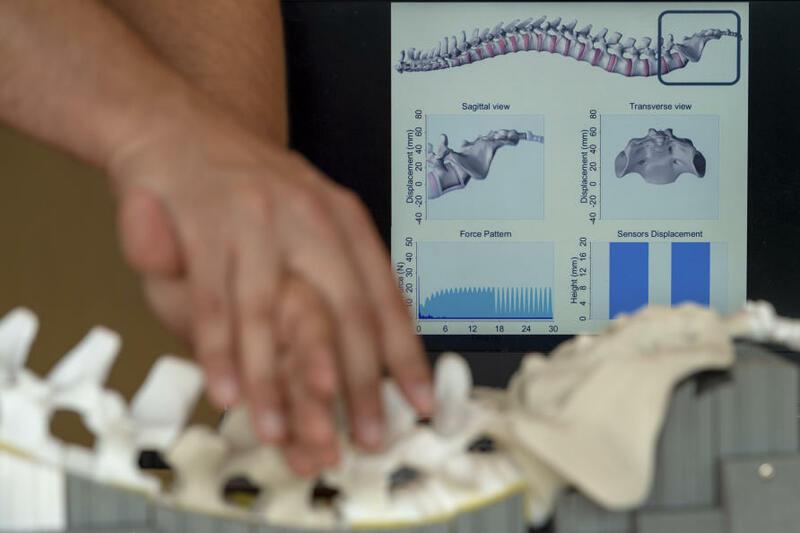 The device looks and feels like a human spine and uses conductive foam sensors to measure the pressure applied to the spine by the whole hand or individual fingers during a simulated spinal assessment. It provides visual feedback on a student’s technique while they mobilise the spine. Typically, to teach these skills the instructor demonstrates a force pattern on a volunteer and asks students to practise on each other by replicating the movement. However, because these movements are very subtle, it is difficult for students to observe them fully. Similarly, when students perform the movements themselves, it is difficult for instructors to provide feedback based only on what they see. To solve this problem, SpinalLog enables the instructor to record a pressure pattern using the device. The student can then see the pattern recorded by the instructor and attempt to replicate it based on the visual feedback on the screen. The system shows a 3D model of the spine with corresponding plots that visualise the force exerted by the student. This 3D model precisely replicates the shape of the 3D printed spine that the user is manipulating. SpinalLog’s capability is enabled by a novel sensing technology – a force-sensitive foam. This material changes its electrical properties depending on how much you squeeze it. This allows the researchers to create modules that sense the specific pressure on each vertebra of the spine. Another advantage of this technology is that are harder or softer foams can simulate different conditions of the spine. This gives students the opportunity to experience spinal conditions other than those they would normally experience in the classroom. How can physios motivate us to do more physical activity? Preliminary tests show the visual feedback has a huge impact on students’ ability to replicate the force pattern demonstrated by the instructor. Also, the physical resistance of the foam gives students a better feeling for what it’s like to mobilise a real spine. It offers students a safe way of practising their skills before moving on to a volunteer. 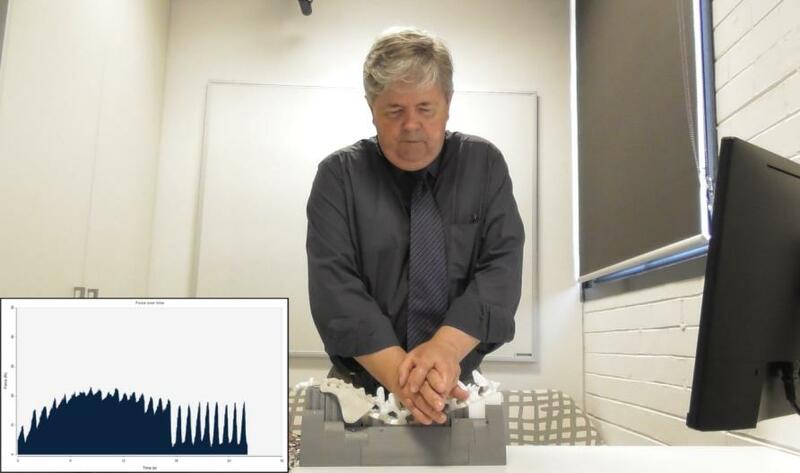 The SpinalLog system is being used by the University of Melbourne’s Department of Physiotherapy to teach spinal mobilisation and in the future, researchers hope to investigate the long-term impact of the tool as a teaching aid. The system offers a number of potential benefits. First, by practising on a system, rather than taking turns as volunteers, the practise time in class can almost be doubled. Secondly, because each instructor can only give feedback to one student at a time, the system can substantially increase the amount of feedback each student receives. And thirdly, by making visible the internal structures of the body such as bones and muscles, the system can give students a better idea of what happens inside the body as they mobilise the spine. SpinalLog is the latest in a number of collaborations we have worked on with physiotherapy experts. Others include systems for teaching anatomy in augmented reality, for enabling remote diagnosis of foot problems with smart socks and monitoring arm rehabilitation with wearable technology. Interactive technology promises to have an important impact on teaching and learning across many fields. And educators are increasingly recognising that simply relying on a mouse and keyboard are no longer the most effective way to give students a successful learning experience. The research won the Best Paper Award at the International Conference on Tangible, Embedded, and Embodied Interactions in the US, 17-20 March, 2019.